Welcome to CC International, Ltd.
Back Row Standing: Robert Campbell, Founding Board Member; John Weaver, Board advisor; Penny Weaver, Secretary; Florence Parsons, VP. JOIN OUR "SOUPER" CLUB TODAY! Calling all Campbell Soup Memorabilia Collectors! 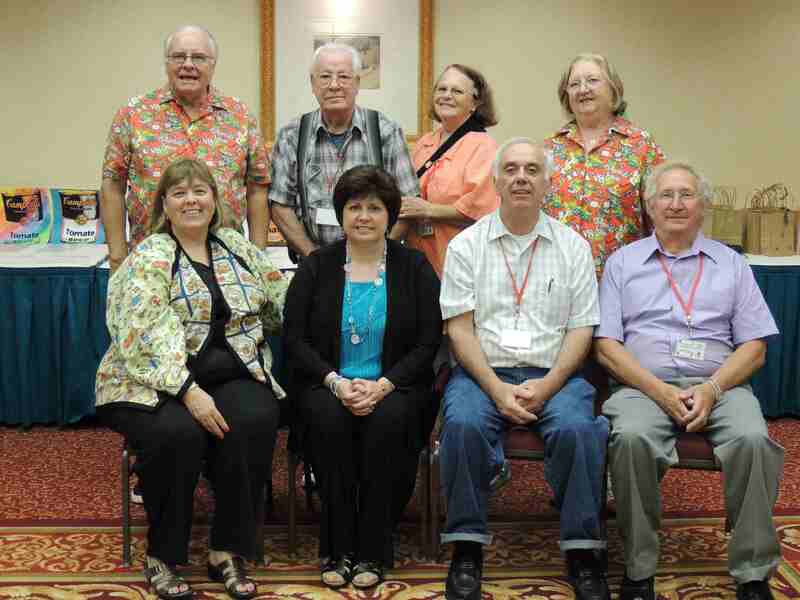 Become a member today and plan to attend our next convention. The Executive Board of CCI, Ltd. invite seasoned and new collectors of Campbell memorabilia to join today! Our goals are to promote fellowship, encourage interest in collecting Campbell Soup memorabilia and to preserve its collectibility. We are a "souper" group of collectors who love those famous Kids. Current annual membership for continuing enrollees: Full membership is $30.00 per year. Associate Member in same household (also known as household member) is $15.00 per year. Place cursor over scrolling message to pause it! The Campbell Kids are the most endearing and enduring of advertising dolls. You may be a collector of "Kids", Campbell Soup logo items, trucks, trains, kitchen items, dolls, posters, die-cuts or anything that is Campbell. If your interest is in one or all of these areas, then we are the club for you. A Collectors Club Especially For YOU! "Souper Sleuth Alert". Members can now select "New Collectibles" to see what is available in stores NOW!!! "Member Discount". Members can receive "discount" from www.campbellshop. Enter members area for more info. due to the unwanted postings that were occurring at an alarming rate. from Convention 2016 in Lancaster, PA.
from Convention 2014 in Pittsburgh, PA.
from Convention 2010 in Downingtown, PA.
from Convention 2004 in Southern Pines, NC. from Convention 2002 in Niagra Falls, NY. for the Campbell Soup Company. The contents of this web site are the property of CC International, LTD, except where noted, and may not be borrowed, copied, or used, without the specific written permission of CC International, LTD.